Doin’ it right, ALL TIMES. Dan gives Sagat’s commercial air enterprise the thumbs up. To start with we just kicked about the centre for a bit, lookin’ at Chinatown and all the lovely tall buildings. We were crashing at Si’s apartment for the weekend, and it wasn’t half pimpin’. Beautiful big apartment well up in a tower block in the city centre. Them views man, them views. I think that sort of thing is enough to make me fall in love with any city. We had a few beers and called it an early night – the following day was gonna be a big one, and one of the main reasons we had our kilts on – the results of the referendum on Scottish independence were to be coming through. My phone fully charged, I kept an eye on the results as they came in. It started off not great, but at one point was a fraction of a percent away from being a Yes result. Cheers, Dundee! Unfortunately after that point it all went downhill, with my home town of Aberdeen providing a shameful 60% No vote. Oh well. 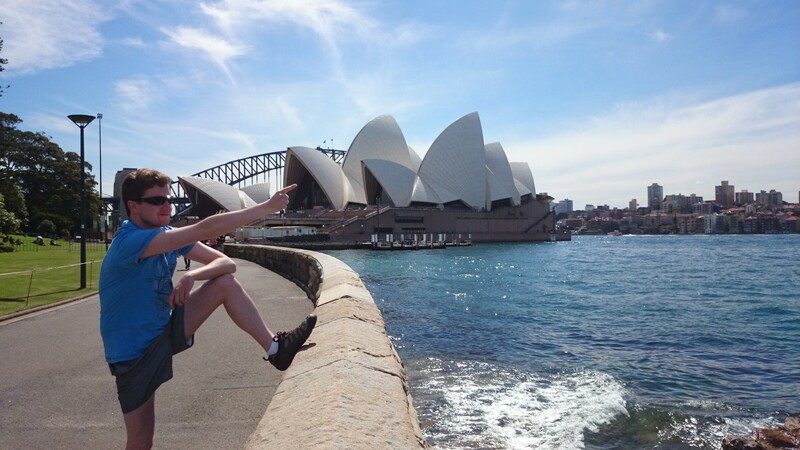 Oh hey, we saw some things in Sydney as well. So we didn’t get the referendum result we wanted. In the end we had a 55% no vote, which is pretty darned close anyway. We were chuffed that almost 85% of people eligible to vote went out and did so, that’s a pretty great engagement. Still, you can’t argue with democracy. So to cheer us up, along came a familiar face… This gentleman is Ben, who Jen and I met in a hostel in Bucharest. He’s a Sydney local, so I said we should catch up, and catch up we did! Only briefly on this occasion, he had other matters to attend to, but we had a couple o’ commiseration drinks and he showed us the ropes of putting bets on hoerses and degs. So we went back to the flat, donned our kilts, and went out for the night. Dan got pretty smeshed, and insisted we go out to get some dumplings in the early hours of the morning. Well after a futile search for Chinatown (which we were actually right on the edge of), we settled on a kebab. Now home for SLEEPS. Big day tomorra, doncha know. Put yr claymore away, Dan. So after a long and thoroughly enjoyable day at the fayre, we headed back into Sydney town to sample the delights of the Lowenbrau pub. Now, Lowenbrau Oktoberfestbier is one of my favourite beers of all time, so when I found out they were selling it, I was all over that. GET IN MY BELLY. I was in a happy place. Good beer, good company, and all the barmaids were dressed in their buxom German kit. A litre of Lowenbrau Oktoberfestbier, eh AYE. We hit up a couple of other pubs after that and ended up in a nightclub. The music was rubbish, but it was a lot of fun, drinking and dancing like eejits. It was a mild disaster though, I lost my sunglasses to the feet of the crowd, and we all got soaked in flourescent paint sprayed out from the stage. Some fine sporrans were ruined (lucky for me I’ve only got a cheap-o one). Dan’s brand new Moorings t-shirt though… it’s in a bad way. The next day we did some more sightseeing. And then we caught up with Ben again, who kindly drove us around to show us the sights of Sydney and the surrounding areas. It was pretty damn cool, Sydney has some awesome coastal features, cliffs and that. We went by Bondi Beach as well, and we were total surprised by how small it was. I was expecting it to stretch over the horizon, but it was pretty tiny. Not bad like, just a case of “is that it?”. He then drove us around the coast and we ended up at a bowling club bar overlooking the sea, pretty spectacular place to stop for a pint. All in all, a grand wee tour, and it was bloody good to be hanging out with the boy again. We didn’t have a late one that night, we had a plane to catch the next day. We left pretty damned impressed by Sydney. I was especially keen on it as it had been hella warm, as opposed to Melbourne which had felt more like Aberdeen in the two days I’d spent in it by this point. That said, I have seen a lot more of Melbourne now, and the weather is picking up (although it can still be pretty temperamental – it was 33° yesterday, today it feels pretty damn cold). So yeah. Sydney! Pretty damn cool city, I LIKE.